Leading companies operating in the global market for mycotoxin binders are pouring money into research and development of new and better products. This way they are trying to tap into a larger customer base and grow their sales and revenues. Proving to be a major growth driver in the global market for mycotoxin binders is the rapid pace of urbanization and the consequent change in food habits of people, leading to the increased demand for meat and poultry products worldwide. This has necessitated the reduction in feed wastage of livestock animals. With high amounts of insect and fungi infestation, essential nutrients are lost on the animal feed. Mycotoxin binders are added to those to prevent the animals from ingesting toxins from the contaminated feed. In this way they help to enhance the quality of the meat and also cater to the increasing demand for organic meat. Besides, the market is also predicted to make gigantic strides on the back of rapid industrialization. Posing a roadblock to the market, on the other hand, is the requirement for specific in activators for various mycotoxins. 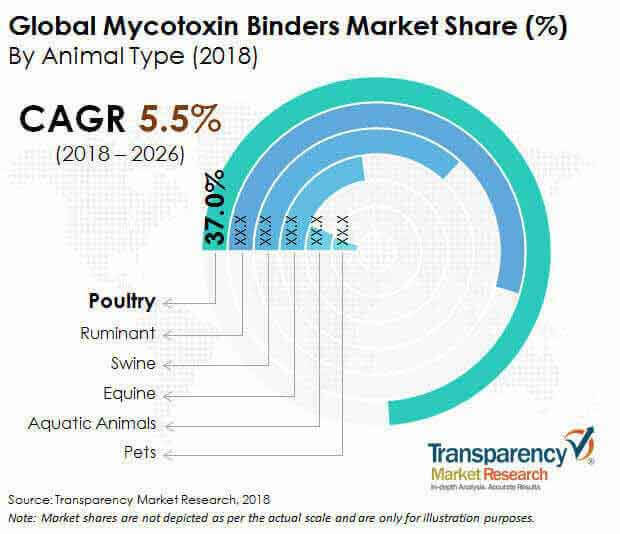 As per Transparency Market Research, the global mycotoxin binders market will likely rise at a healthy 5.5% CAGR from 2018 to 2026 to become worth US$1568.4 Mn by 2026 from US$1023.8 Mn by the end of 2018. The global mycotoxin binders market can be divided on the basis of product type into adsorbents and denaturants. The adsorbents are predicted to account for a relatively greater share in market – about 83.9% of market share by 2018. The segment is slated to pull in revenue to the tune of US$1,301.5 Mn by 2026 by rising at a CAGR of 5.5% between 2018 and 2026. Based on the type of animal again, the global mycotoxin binders market can be divided into swine, poultry, ruminant, aqua, pets, and equine. Among them, the segment of poultry accounts for maximum market share on account of enormous consumption of poultry meat worldwide. By expanding at a CAGR of 10.4% between 2017 and 2025, the segment is expected to rake in a revenue of US$686.3 Mn by 2025. In terms of growth, segment of ruminant will likely outpace all others to gain maximum share. The report by TMR predicts the segment to clock a CAGR of 11.5% from 2017 to 2025. From a geographical standpoint, currently Asia Pacific excluding Japan leads the global mycotoxin binders market. The market in the region is primarily powered by China. In terms of growth rate, on the other hand, the market in Latin America is projected to outshine all others by registering a CAGR of 5.9%. This is because of the rising knowledge about mycotoxins in feed and its effects growing steadily over time. Further, considerable increase of mycotoxins in the upcoming years will also push up demand for mycotoxin binders in the region. Another factor serving to boost the market in Latin America is the thrust by most companies domiciled in the region on research and development to come up with more effective products. Some of the key companies operating in the global market for mycotoxin binders are BASF, Syngenta International, E.I. du Pont, Kemin Industries, Bayer, Nutreco, Impextraco, Novus International, Cargill, Biomin, Olmix S.A., Kemin Industries, Inc, Venkys (India) Ltd, Anpario Plc., Impextraco N.V., Industrial Técnica Pecuaria, S.A., Norel S.A, Neospark Drugs and Chemicals Private Limited, Lipidos Toledo S.A., Alltech Inc. and Perstorp Holding AB. This report provides forecast and analysis of the global mycotoxin binders market. It provides historical data of 2016 along with actual data of 2018, and forecast data up to 2026 in terms of revenue (US$ Mn). The report also includes macroeconomic indicators along with an outlook on feed market for global market. It includes drivers and restraints of the global mycotoxin binders market and their impact on each region during the forecast period. The report also comprises the study of current issues with consumers and opportunities for mycotoxin binders. It also includes value chain analysis. In order to provide users of this report with comprehensive view of the market, we have included detailed competitiveness analysis and market key players and strategy overview. The dashboard provides detailed comparison of mycotoxin binders manufacturers on parameters such as total revenue, product offerings, and key strategy. The study encompasses market attractiveness analysis by product type and region. The report includes mycotoxin binders market company profiles and the revenue generated from the companies across North America, Latin America, Europe, APEJ, Oceania, Japan and MEA. Based on product type, the TMR report has segmented the mycotoxin binders market into adsorbents and denaturants. The adsorbents are sub-segmented into activated charcoal, Aluminosilicates, clays, chemically treated silicates, chemical polymers and glucan products, whereas the denaturants are sub-segmented into mycotoxin degrading enzymes, live microorganism and organic binders. The animal types that have been evaluated for their demand potential are: equine, pet, aquatic animals, ruminant, swine and poultry. Based on nature, the mycotoxin binders market is segmented into organic and inorganic. For the calculation of revenue collection of average regional prices were obtained through primary quotes from numerous baby diaper manufacturers, retailers and distributors. All key end users have been considered and potential applications have been estimated on the basis of secondary sources and feedback from primary respondents. Country demand patterns have been considered while estimating the market for various end users of mycotoxin binders in the different regions. Top-down approach has been used to estimate the mycotoxin binders market by countries. Global market numbers by product type has been derived using the bottom-up approach, which is cumulative of each country’s demand. Company-level market share has been derived on the basis of product type. The market has been forecast based on constant currency rates. The report provides detailed competitive and company profiles of key participants operating in the global market. Some of the major companies operating in the Global Mycotoxin Binders Market are BASF, Syngenta International, E.I. du Pont, Kemin Industries, Bayer, Nutreco, Impextraco, Novus International, Cargill, Biomin, Olmix S.A., Kemin Industries, Inc, Venkys (India) Ltd, Anpario Plc., Impextraco N.V., Industrial Técnica Pecuaria, S.A., Norel S.A, Neospark Drugs and Chemicals Private Limited, Lipidos Toledo S.A., Alltech Inc. and Perstorp Holding AB.